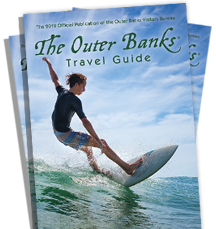 Everyone can enjoy the beaches and fishing that have made the Outer Banks a world-famous destination. Below is a complete listing of organizations that provide adaptive equipment for beach access and fishing; subject to availability. If you have questions, please use the numbers provided. Here you will find a list of Beach and Sound Accesses including handicapped accessible locations. Mobi-Mats are available at the Eighth Street Beach Access and Jennette&apos;s Pier Beach Access. Duck: Call Duck Surf Rescue (252) 982-6747. Kitty Hawk: Call Fire Department (252) 261-2666 for availability. Kill Devil Hills: Call Ocean Rescue Headquarters at (252) 480-0080 for availability. Jockey&apos;s Ridge: State Park (252) 441-7132 or visit the park office for availability. Nags Head: Call Fire Department (252) 441-5909 or Ocean Rescue (252) 480-2555 for availability. Coquina Beach: Call Cape Hatteras National Seashore at (252) 473-2111 for availability. From Memorial Day - Labor Day, available at the beach. Hatteras: Call Cape Hatteras Lighthouse Visitor Information at (252) 995-4474 for availability. Dare County participates in the "Project Lifesaver" program. This program is to assist caregivers of Alzheimer and dementia patients. A transmitter is placed on the patient&apos;s wrist or ankle. Should the patient become lost, a receiver is deployed by local law enforcement to locate the patient. Each of the law enforcement agencies in Dare County are trained and equipped to provide this service to residents and visitors. If you need this service, please contact the law enforcement agency in the jurisdiction you are staying and a representative will be glad to assist you.